Hi everyone, I wanted to share my most recent hobby project: painting a Mortarion for Phil! This model is chock full of details and I only had about 2 weeks to finish him, also Phil wanted him to really stand out on the table and be display worthy afterwards. Fortunately over the course of 14 years I’ve picked up quite a few tricks for building and painting this kind of large model so that they turn out really noteworthy in a reasonable amount of time. So here it goes! For Phil’s Mortarion, I built him up in a few stages to help with painting. Leaving large models partially assembled prior to painting helps a ton for hitting details, such as those under robes or wings, or in the middle of large ornate bases physically under the bulk of the miniature itself. Specifically for this model, I left his wings (and the nurgling wings), the body, and the base as seperate sub-assemblies. 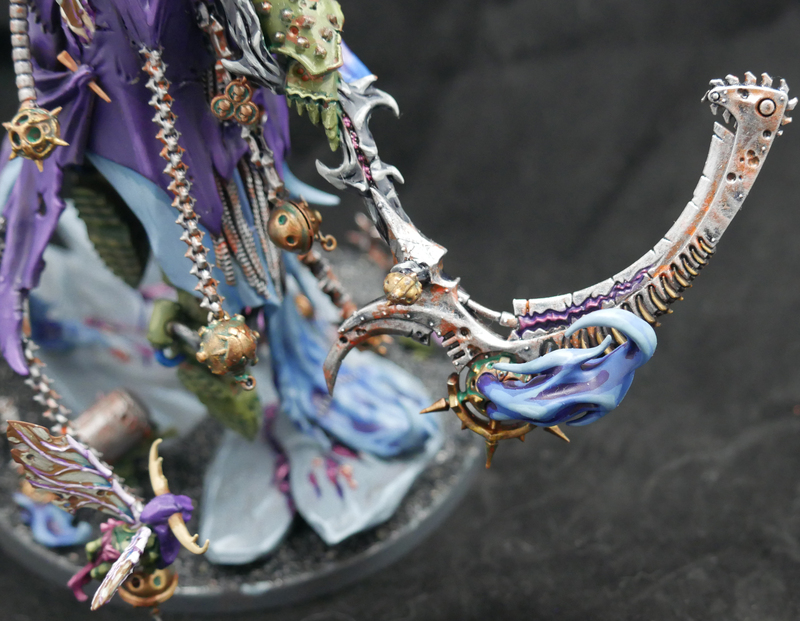 I wouldn’t leave Mortarions arms seperate because there are a few tubes that connect from the torso to the arms that would be awkward to assembe once fully painted. For some models like imperial knights that have defined arm assemblies that’d be fine, but here it would have been counter-productive. I tend to prime and undercoat models brown instead of black. That’s not to say that I’ll never use black primer on a model, but I’ve found over the years that brown as a base for a model allows you to make the model brighter instead of darker, without worrying about finnicky white primer. For this model, I used Citadel Mournfang Brown for the priming and basecoat on both the torso and the wings, and normal black primer on the rocky base. This made painting all the lighter colors like the greens and bone colors way easier to work up to, while black on the rocks works fine for working them up through grey highlighting. 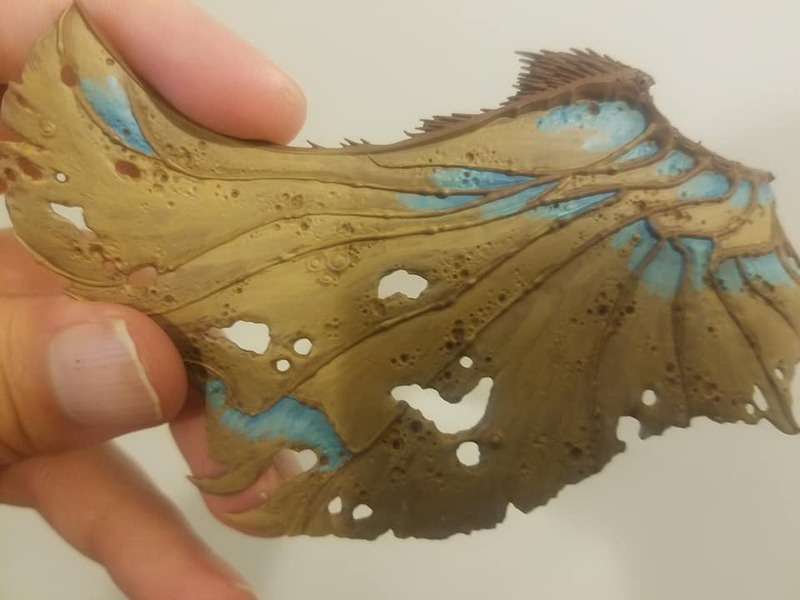 Brown serves as a great warm base color, here you can see how I started the highlighting in the wing membranes using a wash of XV88 over a Mournfang Brown base. 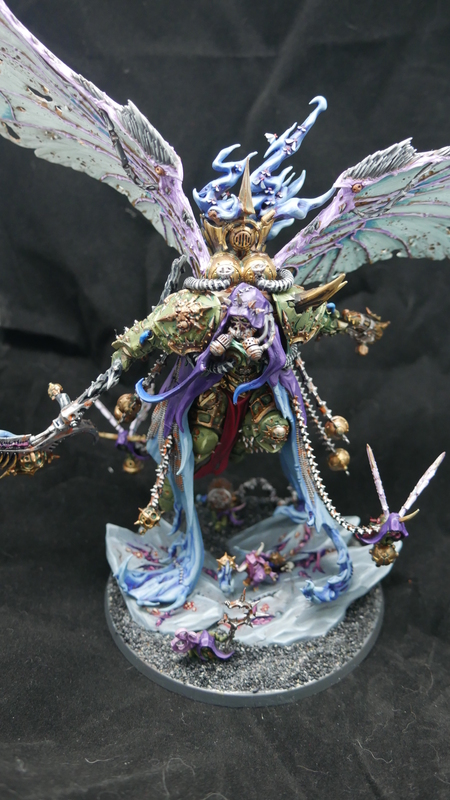 I did a lot of blues and purples on Mortarion, most notable to me was the sickly blue mist coming from his back and robes. To get a vaporous effect on the model I started off by painting the areas with Citadel Teclis Blue. I then applied a fairly heavy glaze of watered down Naggaroth Night, and then re-highlighted with Teclis, and then doing various blends of Teclis Blue, Lothern blue, Screaming Skull, and White Scar as final highlights. I wanted to give a weathered look to Mortarion’s armor and scythe, so I applied a simple rust effect. I first painted the metal Citadel Ironbreaker, and then washed it with Reikland Fleshshade. I then stippled on rough layers of Skrag Brown, XV88, and a light amount of Troll Slayer Orange. You can use a darker orange if you dont prefer that extreme of a color of course. Then I very lightly drybrushed the metal areas two times each with Ironbreaker and Runefang Steel. For corroded gold/brass censers and armor ridges I started with Warplock Bronze, then painted over that with a layer of Hashut Copper. Then I applied a thin wash of Reikland Fleshshade, a medium glaze of Warpstone Glow, and then re-highlighted with Hashut Copper, a 50/50 mix of Hashut Copper/Rhulic Armor Gold, and then a final highlight of that with a bit of Runefang Steel mixed in. In my experience, adding silver to gold is a really good way to get gold even brighter for your final highlights. For the scythe and censers, I employed some weathering techniques using orange tones and green washes, respectively. I really need to learn how to airbrush. I did this entire model just with brushwork and while the end product was really great, it would have really expedited basecoating the large areas like the wings, armor and base having an airbrush. I also wouldn’t mind doing some conversion/kitbash work on a Mortarion. I think when I get one of him for my own collection I’ll probably kitbash him with a Zombie Dragon from Age of Sigmar, adding the bone parts of the dragon to his armor and swapping his wings for the tattered leathery wings. It’s something I look forward to doing, and probably writing a conversion article about to boot.